It took Dwight Phillips a little longer than he planed to get it to Centre College, but it took him very little time to feel right at home there. 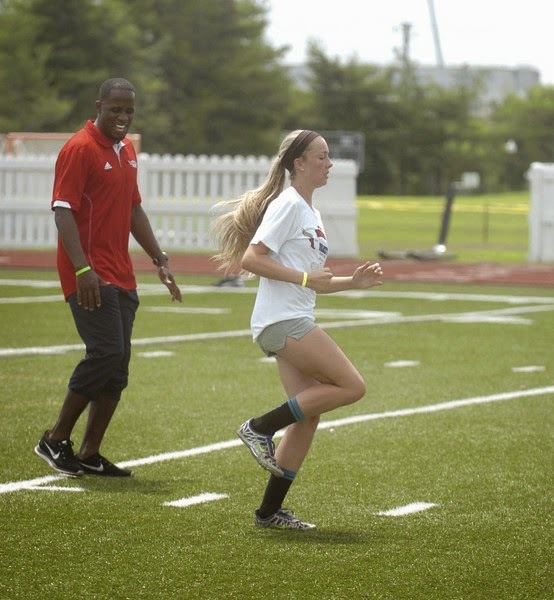 Three years after he was scheduled to teach at the very first Maximum Velocity Track and Field Academy, Phillips finally made it to Danville this week for the fourth edition of the camp. Now retired from competition after a 14-year career at the international level in which he won an Olympic gold medal and four world championships, Phillips was one of eight Olympians among the group of camp clinicians. A competition conflict forced him to cancel his trip to Centre in 2011, but he said he had heard good things about the Centre camp from Sharrieffa Barksdale, who helps organize the athletes who come to teach each year for camp director/Centre track coach Lisa Owens, and from some of the athletes who have served on the staff in its first three years. Phillips is no stranger to teaching. He coaches a handful of athletes in the Atlanta area and has partnered with Hazel Clark-Riley, another Olympian on this year’s Maximum Velocity staff, in Future Olympian Sports Clinics, an organization founded and run by Olympians who share their stories and skills in hopes of inspiring the the next generation of Olympic track and field athletes. “This is a part of me. This is what I do,” he said. Phillips had his own inspirations when he was a high school athlete. “I can just remember when I was at this level watching a Carl Lewis or Kevin Young. I remember watching them winning gold medals, setting world records, and it wasn’t really even within my realm to think that I could achieve that,” he said. “I just really admired that they worked hard and they were having so much fun doing it. I was like, ‘Wow, I wish I could feel that same type of feeling,’ and many years later I was able to achieve that. The road to that success began at Kentucky, where the Decatur, Ga., native competed for the Wildcats in 1997-98 before transferring to Arizona State. It was in Lexington that Phillips met Edrick Floreal, who was an assistant coach at the time and who returned as the Wildcats’ head coach in 2012. And it was Floreal who told Phillips that his athletic future would not be in sprinting, but in jumping. He followed his sprints coach at Kentucky, Darryl Anderson, to Arizona State, but it was there that his days as a 400 runner came to a sudden end. Phillips, who had tried the triple jump in addition to the 400 at Kentucky, finished eighth in the long jump at the 2000 Sydney Olympics and at the 2001 World Championships. He won indoor and outdoor world championships in 2003, then won Olympic gold in 2004 in Athens, winning the competition by just 12 centimeters despite a leap of 8.59 meters that was the fourth best jump in Olympic history. Floreal, who was in Athens as coach of another athlete, was by Phillips’ side as he went for gold, walking with him in a mostly silent lap around the track to prepare him for his jumps. Phillips went on to win a total of four world outdoor championships — he is the only long jumper ever to do so — and his personal-best jump of 8.74 meters in 2009 leaves him tied as the fifth best jumper of all time. However, he missed the 2008 Olympics after finishing fourth in the U.S. trials, an injury kept him out of the 2012 games and he retired after the 2013 World Championships. Phillips said his message to the athletes who gathered at Centre is that track and field can do wonders for them as well, even if they never reach the sport’s highest levels.